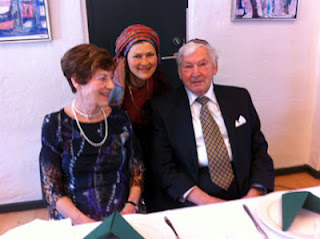 While celebrating my father’s 85th birthday in Denmark, I continue the theme of gift giving in my parasha meditation. The animal sacrifices are difficult to relate to, however I found personal meaning in them with the help of Rav Ginsburgh’s writings, relating the sacrifices to the human psyche. I hope this meditation will be helpful to refine our will and our desires for pleasures, as part of our spiritual preparation for Pesach! Click here to read a special Torah from Rebbetzin Chana Bracha on "The Four Cups during the Seder and Our Four Mothers"
The book of Vayikra is difficult to relate to as it is all about the sacrifices, which we no longer keep. However, learning about the sacrifices becomes more meaningful, when we understand how each part of the sacrifices represents and rectifies parts of our psyche. Two parts of the animal sacrifice in the Temple, the “choice fats” – chelev – (חלב) and the “blood” – dam – (דם) were offered exclusively to Hashem. “It shall be a perpetual statute throughout your generations in all your dwellings, that you shall eat neither fat nor blood.” This eternal prohibition pertains to both the person bringing the sacrifice and the Kohen, no-one may partake of the choice fat or the blood. Even today, we do not eat the “choice fats” or “blood” of the kosher animal. Rav Ginsburg explains how we learn from this that the very best must always be given to our Creator. The crown – keter – (כתר) of the Jewish soul includes the super-conscious “pleasure” – ta’anug – (תענוג) and the “will” – ratzon – [רצון) [3) The conscious intellect and emotions are like the wheels of a machine, dependent on the vital energy of these two powers. Our “will” and “pleasure” are represented respectively by the “blood” and the “choice fats.” When a person brought a sacrifice, the blood of the slaughtered animal would first be sprinkled on the altar. This would culminate the process of offering up of one’s will to G-d. Afterwards, the Kohen would burn the choice fats on the altar. This would culminate the process of offering up one’s pleasure to G-d.
Hashem’s Divine Presence was most manifest within the Temple. During Temple times, the Divine service would actually reach into our unconscious and rectifying it. The process of the sacrifices thus ensured the righteousness of all those who came to the Temple. Without the Temple, we cannot access the far reaches of our unconsciousness. Yet, the prohibition to eat the “blood” and “choice fats” of any kosher animal still applies. Therefore, we must still rectify our will and pleasure to whatever extend we are able, and offer them up to Hashem. This meditation is designed to help you get in touch with your will and desire for pleasure, in order to help us rectify them and give them over to Hashem. Make yourself comfortable and close your eyes. Take several long deep breaths and get in touch with your body sitting on the chair or cushion. Feel how your breath is actually Hashem breathing through you. Imagine how your breath brings oxygen to your bloodstream. Breathe into your arteries, and imagine how your blood circulation is invigorated by your conscious breathing. Allow your day to pass through you, visualize all the things you accomplished and all those things you didn’t yet get to. Get in touch with your will! What would you like to do the most if you were able? Imagine all the things you would want to do if you only could. Now take all of these things – the manifestations of your will and place them into a box, wrap it with beautiful wrapping paper and tie it with a ribbon. Imagine placing this box in your palms facing upwards offering your will to Hashem. Imagine the box being gone from your hands, and replaced by a different gift, which you now hold in your hand. Open it and behold Hashem’s gift to you. Hashem is giving you a refined will, all the things you always wanted to want are in this gift for you. Feel your appreciation of this gift Hashem is giving you! Now take several relaxed breaths and allow your mind to wander to all the things you enjoy. Think about what gives you pleasure, it could be a gourmet meal, an intimate encounter with your beloved, a loving interaction with your child, a special honor or award you received. Take those things which give you pleasure and place them in a new box. Wrap it beautiful with a nice ribbon and again offer it up in your open palms to Hashem. Again your gift has been received by Hashem and replaced with His personal gift to you. You unwrap your spiritual gift and discover the spiritual pleasures that are your true pleasures. Unwrap each pleasure one by one and try to get in touch with the warmth, love and joy each of these spiritual pleasures give you. Gently tap your hands and feet on the ground and table before opening your eyes to face a new refined reality. There are actually three points of the crown: (רצון) – “will”, (תענוג) – “pleasure” and (אמונה) –“Emunah” – simple faith. When a sheep is brought as a sacrifice, in addition to the “blood” and the “choice fats,” the rump, located near the tail of the sheep is given exclusively to Hashem. This third part – the rump – is even fattier than the fat, i.e., it represents even more pleasure than pleasure. The Hebrew word for “rump” is אליה, begins with the letter alef (א). The first letter of the (חלב) – (“choice fats”) is chet (ח), and the first letter of “blood” (דם) is dalet (ד). Together these three letters spell out the word (אחד) – “One”. The two levels of pleasure and one level of will form our complete Oneness with Hashem. Perhaps we can say that by means of refining and offering our will and pleasure we can reach the level of emunah in the One and only G-d, to Whom all our desires and pleasures must be directed. See for example Vayikra 7:3.